This has been on my list for a long time. You chose a fantastic combination. Refreshing and tasty! Wow that drink is calling me ! The Color looks awesome and the flavours are unique , simply amazing ! Colorful and refreshing drink. Both the fruits you used have wonderful flavor and add juicy sweetness. Such a fabulous combination, this drink looks ultimate and quite a refreshing summer drink. Pretty colour as well. I have had this on my list as well and yet keep wondering what to make everytime this theme comes up!..Looks so stunning harini, enjoyed all your drinks this week! Refreshing drink and the the color of the drink is making me to give a try.. This drink looks awesome. With pineapple and strawberry, this is one flavouful beverage perfect for summer. My boys love pineapple and strawberry. The drink looks so lovely and it is perfect to cool them after a hot day at pool. Pineapple and Strawberry is a deadly combo and the name sounds so fancy too..Love this Mexican drink. Wonderful combo of strawberry and pineapple....kid's favorite. Tomorrow my daughter's friends are coming for a get together. I am going to make this for them. 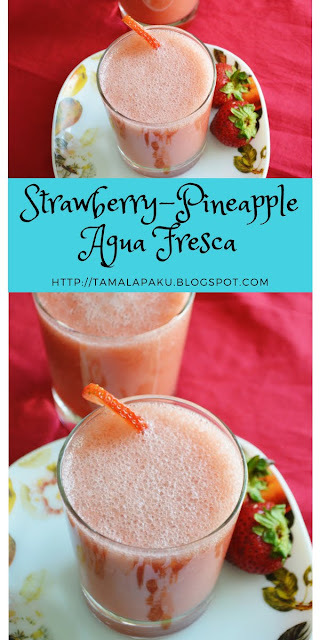 Strawberry and Pineapple sounds awesome.. Love the blend of fresh fruits!! That is a wonderful fruit combo Harini and the glass of juice is totally calling out to me! That's a wonderful combination of strawberry and pineapple....looks so refreshing! Awesome pics Harini!